Enkosi's Aluminium Profile System: Joining Components and Fasteners for the Manufacturing Industry | Enkosi Pty. Ltd.
Aluminium Profile Systems (APS) fall into a real manufacturing sweet spot. Imagine the benefits that come courtesy of this drill-free assembly approach. 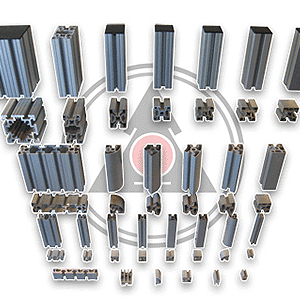 Prefabricated elements connect to each other like building blocks. They form every conceivable shape while leaving room for future modifications. Employed in workshops, assembly lines, manufacturing plants, and other applications, the ‘T’ slot profile demonstrates an array of usage options. Let’s attach our brand to the system. Take a few minutes to check out the catalogue. There’s plenty to look at, with the basic aluminium profiles taking centre stage. They’re the long ‘T’ slot elements that suggest the boundaries of a frame. Besides being exceptionally functional, those parts assemble to produce an aesthetically attractive design. The aluminium base material is light, polished, and smooth to the touch, yet it’s stronger than it looks. Step back a little, though, for that’s when the model of functionality is properly resolved. Back to that building blocks concept, the employment of a few tools is all it takes to create an inexhaustible number of metal frames. A storage cabinet, an assembly line, even a computer station, they all assemble modularly thanks to Enkosi’s Aluminium Profile System. Frankly, if we weren’t placing a heavy focus on the modern aluminium base material, we’d probably call this a flexible profile framework because countless functions and profiles become realizable when these industrial-scale building blocks assemble in new and innovative ways. Surpringly, and impressively, a technician only requires a few hex keys to get Enkosi’s APS gear up and working. Bolts and nuts fasten the discrete elements in place. Furthermore, those parts will slide along a grooved profile until they’re positioned just as the design states. That’s another point in the plus column, one that falls neatly under the flexibility subheading. As for the type of accessories that accompany such an adaptable profile system, imagine a limitless selection of parts, including washers, slide nuts, roll-in fasteners, hinges, and more. Finally, this isn’t the kind of gear that assembles like a household piece of furniture. No, Enkosi’s Aluminium Profile System has access to the latest CAD software tools. Acting as the visually-oriented brains behind the structuring profiles, the software operator wields those building blocks with some authority. Granted access to this functional, attractive, rigid assembly solution, that expert operator is imbued with the power to construct practically any structure, from an ordinary workshop table to a dynamically capable machine assembly line.